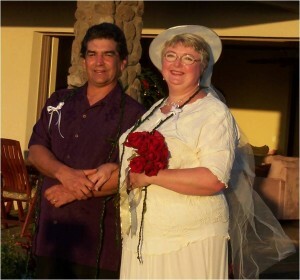 Steve and Roberta McHatton celebrating their 10th wedding anniversary in Maui on December 23, 2006. Some people find their mates online. Others are introduced to their significant other by a mutual friend. 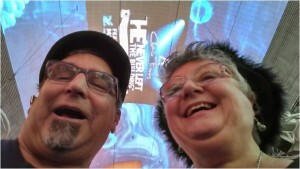 And for some lucky people, like Roberta and Steve McHatton, they just happened to catch the right bus at the right time. Roberta and Steve met on a TriMet bus in December 1995. He scooted over to offer her a seat. Impressed, she struck up conversation that led to a surprise birthday card sent to her apartment building, a first date – they took the bus to the Rodin exhibit at the Portland Art Museum – and many other firsts as they rode TriMet on the road to marriage. She remembers meeting his mother for the first time and the bus ride home from Vancouver, Wash. “A snowstorm hit and the snow was falling hard,” said McHatton. “It made the ride much longer but we didn’t care, we were in love,” she laughs. Both Roberta and Steve were 42 years old when they made their love connection on TriMet. They married within the first year and will celebrate their 20th wedding anniversary this year, on December 23. So did you meet your sweet on TriMet? Let us know and you could win the ultimate Date Night Package. Just go to TriMet’s Facebook page and submit your TriMet-inspired love story, in 250 words or less, before 5 p.m. on Monday, February 2 for a chance to win. TriMet will post the stories on Facebook so the public can vote for their favorite until the contest ends at 5 p.m. on February 9. The winning couple scores a romantic date night package, which includes a one-night stay at Hotel deLuxe, a $100 gift card to Gracie’s Restaurant, a $50 gift certificate to Living Room Theaters and a $20 gift card to Cacao.